Poor actors, the world of TV isn't as glamorous as it appears, and these days it seems gratuitous nakedness seems to be a part of the job description. 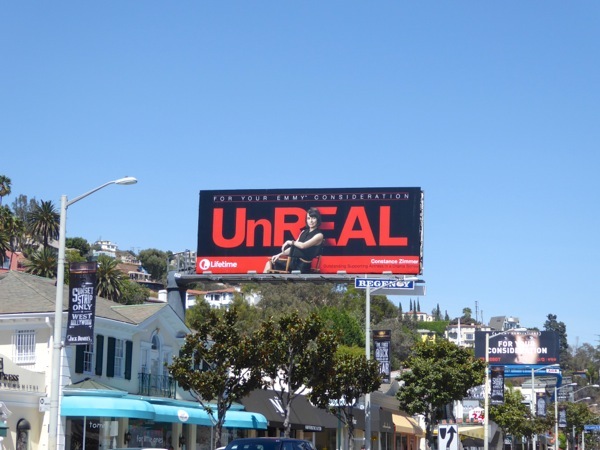 The latest TV show trying to grab your attention in the skies of L.A. with little left to the imagination, is Lifetime's UnREAL. The series goes behind-the-scenes of a fictitious dating competition show, Everlasting, and follows the exploits of the young producer 'Rachel Goldburg' (Shiri Appleby), tasked with manipulating the contestants to get the most outrageous footage to boost the ratings and keep viewers watching. 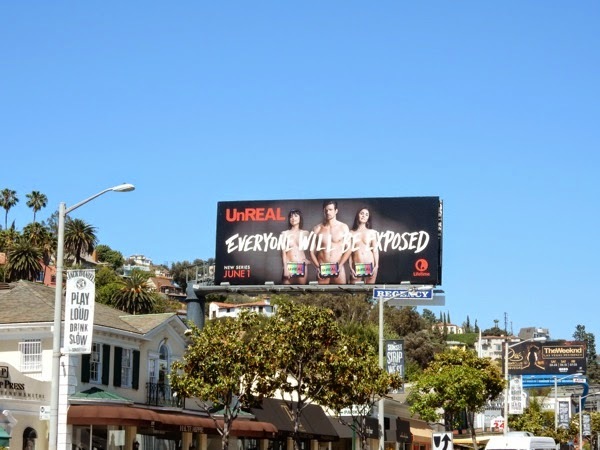 Stripping off in this series premiere ad creative are Constance Zimmer (as her demanding boss 'Quinn'), Josh Kelly (her ex and cameraman) and Shiri Appleby herself. 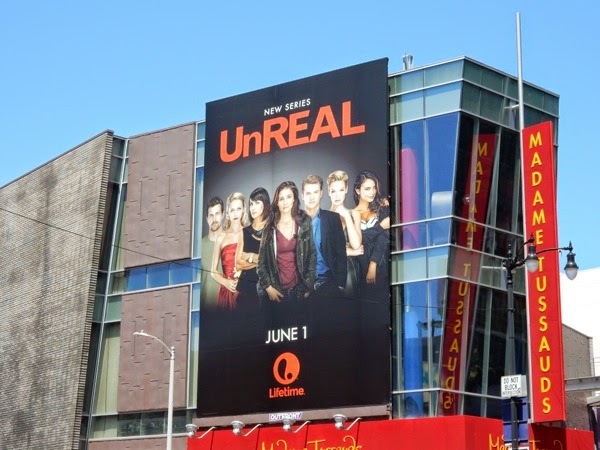 These 'Everyone will be exposed' teaser billboards were snapped along Sunset Plaza and San Vicente Boulevard on May 2, whilst this portrait billboard featuring the wider (and fully clothed) cast of UnREAL was spied along Hollywood Boulevard on May 10, 2015. 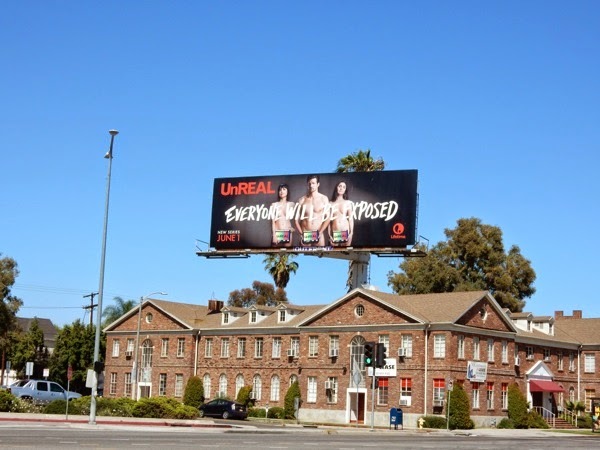 It's not the first time that Lifetime has resorted to titillation to turn heads, as Heidi Klum is forever getting naked in these Project Runway billboards, the men were showing off their muscles for these season two Witches of East End billboards and Jennifer Love Hewitt wasn't afraid to strip off for these billboards for The Client List. 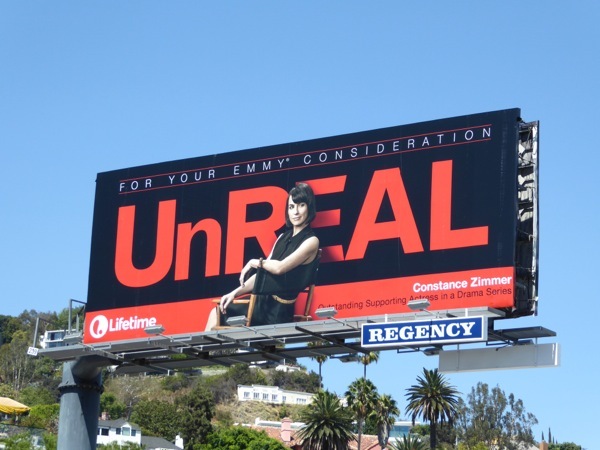 UPDATED: In addition to Constance Zimmer winning the Critics' Choice TV Award for Best Supporting Actress in a Drama Series portraying 'Quinn King', the show's first season was also nominated for two Emmy awards, again for the actress and another for Outstanding Writing. 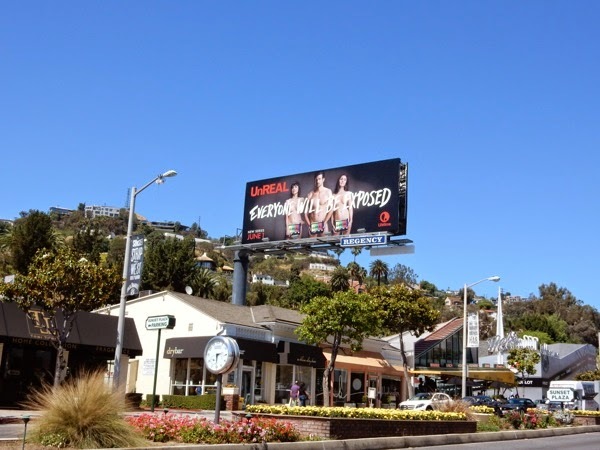 This bold black and red Emmy nomination billboard certainly stands out along the Sunset Strip on August 19, 2016.